February 21 – July 15 in the Katherine and Clifford H. Goldsmith Gallery at the Center for Jewish History. Munich evokes images of the Oktoberfest and oompah bands, and in many ways, this reputation is well-deserved. This idyll of beer gardens and sausage is viewed, at least in the imagination of the millions of tourists that flock there every year, as quintessentially German – not exactly the sort of place one would find traces of a rich Jewish past. The fact that the National Socialists considered Munich the spiritual and organizational home of “The Movement” does little to dispel this notion. Before the Nazi regime, however, Jews were instrumental in shaping the traditions and character of Germany’s third largest city, from Löwenbräu beer to the top purveyor of Lederhosen and Dirndl to the city’s champion soccer club. Like Jews across Germany, they considered themselves as much Germans as Jews, but they could add a third identity to their hyphenated existence – Bavarian. Today, seventy years after the end of World War II, Munich is again home to a flourishing community of 11,000 members, the second largest in Germany. 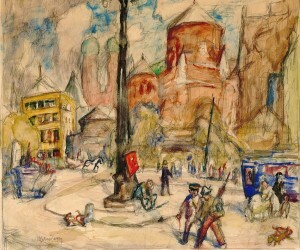 This exhibition of materials from LBI collections documents the rich Jewish past and promising Jewish future of Munich.